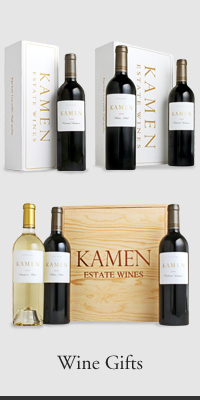 The 2014 Kamen Syrah was crafted from grapes harvested at optimal ripeness, de-stemmed and co-fermented with Viognier skins and sun-dried Syrah stems. We believe this proprietary practice adds both aromatic and textural layers. The result is a Syrah that showcases deep extraction, purity and balance. This opulent wine offers substantial flavors of boysenberry, black raspberries, scorched earth, suede, purple wildflowers and crushed rock. Notes of white pepper, forest floor, plum pie and savory barbecue add to the full spectrum of flavors in this ultra-complex Syrah. A plush mouth-feel is followed by fine grained tannins giving this wine impeccable balance and an extraordinary, mouth filling finish. This beauty sings now, but will drink well over the next 30 years.